Rainy days don’t have to be gloomy. They can be fun for kids even if you decide to stay indoors with them or even play outside in the rain. We have a few tips for you on how to have a great time during rainy days. How about a scrabble game with them on a rainy morning or afternoon? Try these scrabble pencils to take note of your scores and they can even be used for creative doodling or drawing. Bake your favourite muffins with the kids. Make baking a bonding time with them as you cook your favourite muffins or cupcakes. Sing in the rain and play some music with your kids. These electronic drumsticks will help you have fun making music. Cuddle up and have a good afternoon nap on a rainy day. Let your child hold on to this bashful Panda as he lulls your little one to sleep . Play with toy guns. These are mess free and can be good for playing sci-fi cops and robbers indoors. Complete this Tetris jigsaw puzzle. It’s a colourful and engaging way to spend time on a rainy afternoon. Mix and blend theirfavourite warm cocoa drink on a cool rainy day with this playful Pac Man coffee mug. Relax and lay down with the kids with this puffy splat pillow. Give your kids a bubble bath. Let them enjoy taking a bath with these bath sponges. There are more rainy day items at www.yellowoctopus.com.au. Matt: Marketing Maestro It’s all very well and good having the absolute best gifts under the Australian sun, but word needs to get out to all potential Octopus aficionados about what our Cave of Wonders has to offer. 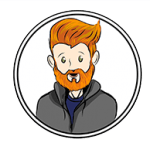 Luckily, we have this flame-haired marketing maestro to make sure the name of Yellow Octopus is shouted from all the rooftops and heard through every grapevine. Matt is a magician at marketing matters and has spread the word of awesome gifts to every corner of Straya and beyond. His ideas just keep getting cooler and quirkier, so keep an eye out for exciting developments happening in the very near future!